Greasy or oily patches on a solid floor in a garage, shed, cellar or kitchen, must be removed before you lay floor coverings. Grease can build up to such a level that it becomes a hazardard, you should apply a concrete paint or a proprietary grease removing solution, which you can buy from motor accessory shops. Scrape the floor to remove as much grease and dirt as possible and brush on grease remover solution until the surface appears thoroughly wet. Leave for up to 15 minutes for the grease to soften and agitate it with a stiff brush from time to time. If necessary, apply more solution until the grease stain takes on a soap-like appearance. Wash with water and brush the floor; repeat the treatment if the stain remains after the floor has dried out. This can be cured with a concrete hardening and dustproofing liquid. Sweep the floor or vacuum it clean if possible – and apply the liquid with a brush, according to manufacturer’s instructions (two coats may be required). You can use a PVA bonding agent diluted with water, but allow the treatment to dry before subjecting it to normal traffic. According to the wear the floor receives, the treatment may have to be repeated every one or two years. If you need a more durable coloured finish for a garage, store or outside WC, you can apply a brush-on floor sealing compound to give a tough, dustproof coating which is impervious to water and oil. Mirrors play an important part in interior decoration; if they are carefully placed, a small room can be made to look larger and a dark room appear lighter. In every home there is a place where a mirror can be used to great effect in an alcove, behind display shelving. in a recess or covering a door. But remember a mirrored surface will reflect everything which stands in front of it; so avoid overdoing it by placing mirrors on an adjacent or facing wall since the effect might be confusing and not what you expected. A wide range of mirrors is available, either drilled for screw fixing or undrilled for other methods of fixing. Your glass merchant will be able to supply you with a mirror of almost any shape or size. Any top quality glass, free of imperfections, is suitable for silvering; 6mm float glass is used for most of the larger mirrors. It might be necessary to use a thicker glass for mirror table tops, depending on the size requirements; your glass merchant should be able to advise you. Decide when placing a special order for a mirror whether you will require a screw fixing. If you do. it is worthwhile getting the supplier to do the drilling for you. Large mirrors are expensive and, since the additional charge for drilling is very reasonable considering the overall cost of the mirror, it is best not to risk drilling the holes yourself. All mirrors should have polished edges, unless they are to be set into a hear,y rebated frame, when a clean cut edge will do. Take care when handling cut mirrors with unpolished edges; wear leather gloves since the edges of the glass are razor sharp. A drilled mirror can easily be fixed in place, unless the wall surface is uneven; a really badly undulating surface should be covered with a base board of plywood or chipboard, although it is seldom necessary to go to this trouble. First support the base of the mirror flat against the wall in its final fixing position. It is wise to get help at this stage, if only to check the mirror is set at a true vertical on the wall. Once you have established the right position, mark with a pencil through the drilled holes onto the wall behind. Remove the mirror and drill the wall at these points, using the correct size masonry bit and wall plugs for the mirror screws. The screws used have rubber or soft plastic spacers and collars. Various types are available, although the principle is the same with each. The screw passes through a sleeve, which is centred in the hole of the mirror. At the back a spacer washer fits between the mirror and the wall, while a cup washer is placed between the face of the mirror and the countersunk head of the mirror screw. Great care must be taken when tightening the screws; work round them in turn, gradually tightening each one until is head gently squeezes the soft cup washer on the face of the mirror. Check at this stage the mirror is firmly held against the wall. If it is not, don’t tighten the screws further since this will cause the mirror to break. Remove whichever screw is not gripping the mirror firmly, insert packing behind the spacer washer to fill the remaining gap and screw through the packing into the wall. The decorative heads of the screws can then be fitted into the fixing screws to conceal the screw heads and the washers beneath. Undrilled mirrors can be mounted on a wall using mirror clips. Several types are available, including corner clips, plastic spring clips and hook-on clips. With the hook-on type the bottom clips are screwed to the wall in accurate alignment, so the bottom of the mirror rests on the upward facing jaws. Check your levels carefully before finally fixing these clips. The upper clips have a long slot in the back plate through which they are screwed to the wall, tightly enough to allow the clip to slide up and down behind the screw head. The mirror is then placed in the bottom clips and pushed flat against the wall, while the downward facing jaws of the upper clips remain in the open position. The upper clips are then slid down so the jaws hold the top edge of the mirror. The mirror can be easily taken down by opening the upper clips and lifting the mirror out of the bottom ones. Small mirrors can be framed and backed and hung in position using mirror plates or chains. Larger mirrors can be built into wall fitments and held with facing mouldings and beading. A mirror can also be placed in a sliding frame to provide a mirrored door for a unit. Screws and bolts provide enormous holding power, but are simple to fix. The types shown here are the ones you are likely to come across when fixing both wood and metal, together with the most commonly used accessories. For general use; head let in flush with wood surface. 2. Pozidriv head countersunk screw. Fixed with special non-slip screwdriver. 3. Raised head countersunk screw. For fixing door-handle plates, etc, to wood; decorative head designed to be seen. 4. Round head screw. For fixing hardware without countersunk holes to wood. Extralarge wood screw with square head; tightened with spanner. 6. Self-tapping screw. For sheet metal; cuts its own thread as it is screwed in; has slot, Phillips (cross), or Pozidrive head. For invisible fixings; two pieces of wood twisted together to tighten. For ‘pocket’ screwing; head screwed on from side with screwdriver. 9. Cup hook and screw eye. Large number of shapes and sizes available. For round head screws; spreads load to give a strong grip. For countersunk or raised head countersunk screws; spreads load, improves appearance. For countersunk screws; hammered into pre-drilled hole for a completely flush fixing. Not a screw, but a bolt. Small sizes only; available round, pan, cheese or countersunk heads. Large sizes only; available with hexagonal or square heads. Large bolt with a ‘square collar under the head that stops it from turning when the nut is done up. For bolting wood or metal to concrete; jagged head is set in wet concrete and holds bolt firmly when concrete dries. Commonest type, available in a wide range of sizes. This type available in large sizes only, e.g. for coach bolts. Small sizes only; thinner than l8 in proportion to width. Used on handrail screw (8) and in other places where nuts have to be tightened from the side in a small space. Tightened by hand;’for use where nuts must be undone quickly. Decorative nut, generally chromium plated. For places where vibration might make nuts undo; has fibre ring inside to make it hard to turn. Same as (10); used in same way; also makes nuts easier to turn. For metal fastening only; spring shape prevents bolts from undoing. 26. Internal and external tooth washers. Gripping teeth keep bolts from undoing. 27. Timber connector. Used between pieces of wood bolted together. Used for general heavy hammering, particularly in building and demolition work. In conjunction with a bolster chisel it is used for cutting bricks, shaping paving stones, knocking through brickwork and so on. Used for tacks, panel pins, fine nailing and braddling. The wedge shaped end is used for starting small nails while holding them between your fingers. Warrington or cross pein hammer. Used for general nailing, joinery and planishing or metal beating. Ball pein or engineer’s hammer. Used for metal working. The round end is used for starting rivets, for example. This is the hammer to use for masonry nails as its hardened steel face will not chip. Used for trimming and shaping common or hard bricks which would damage a brick trowel. The combs can be replaced after wear. Used in metal beating and in general work where it is important not to damage a surface. The soft head also avoids the possibility of a spark setting off an explosion. Used for general purpose carpentry, particularly for driving and removing nails. When taking out nails, make sure the nail head is well into the claw and lever evenly. Used similarly to the claw hammer in work where speed rather than care is essential. Used for general screwdriving of single slotted screws. Crosshead screwdriver (Pozidriv or Philips). Used uith cross slotted screws to provide greater purchase and positive location. Used in engineering and otherwise when the screw sits inside a recess of the same width. The insulated handle contains a neon indicator which lights when the blade is touched against a live source. You must ensure that the insulatation is safe for the voltages you intend to check. Archimedean (or Yankee) spiral ratchet screwdriver. Used for general purpose screwdriving. Pushing the handle home automatically drives or removes screws. When locked, at length or closed, the ratchet allows screws to be driven or removed without taking the blade from the slot. The chuck can take blades of different widths and even drill bits. Used for driving awkwardly-placed screws. Cement mortar can be ‘fattened up’ – made more plastic and easier to lay – by adding a squirt of washing-up liquid to it. This must be a soap liquid, such as Fairy liquid, and not a synthetic detergent. When checking that a course of brickwork or other work, is horizontal, ensure that there are no lumps of mortar sticking to the spirit level. Even a small piece would make it inaccurate enough to affect the job. To compensate for any inaccuracy in the level itself, use it once, then turn it end for end and use it again. Do not use a short level for checking a long run. Never wash cement-covered tools in a plumbed-in sink: the cement will set in the pipe and block it. Wash them in a bucket and empty it where the dried cement won’t show. Structural Engineers are not celebrated like the Architects are – because what they do is not a glamorous job. Crunching numbers, loads and weights, resistance and making sure the designs are safe to built – makes them a bit unpopular. Where very heavy furniture and timber used for construction purposes are to be attached to solid walls, expanded masonry bolts should be used for secure fixing. These are inserted into a suitable hole and, when the bolt is tightened, it draws a plug up into the outer body of the bolt, which then expands and grips the masonry. When positioning the holes, avoid drilling in the mortar between bricks and in the corners of the bricks themselves. Lined walls are obviously weaker than solid ones, and great care must be taken when fixing up heavy objects. If there is too much stress on an unsupported wall board, it could rip away from the studs. To make a secure fixing, locate the timber studs and attach a batten to the surface of the wall. The object can then be screwed to the batten. Many interior wall and ceiling surfaces are created by fixing some form of lining, such as plasterboard, to timber supports. The fixings described above, except for the Rawlnut and some nylon plugs, are not suitable for use on these surfaces as they would simply fall out. In some cases, objects can be attached by screws passing through the lining into the timber supports. To locate the position of the studs or joists, tap along the wall or ceiling with a hammer-a ‘dull’ sound will indicate a stud. Before drilling the screw hole, probe with a fine drill or bradawl to confirm you are in the right position. Often, however, the proposed fixing point will not correspond with a timber support (or you may not be able to find them!) and you will have to use a special fixing. A large number of fixings are available and all are designed so that some form of support is provided behind the panel when the bolt or screw is tightened. A metal type of fixing is the metal ‘toggle’. These either rely on gravity to open the toggle when the fixing is pushed through the wall, or are spring loaded. Gravity toggles should be used for hollow wall fixings only as they would not spread the load evenly on a ceiling. Spring toggles, however, are suitable for both walls and ceilings. To attach an article with both these fixings, first undo the toggle and then insert the bolt through the object to be fixed. Attach the toggle to the end of the bolt, fold it flat, and push it through the hole. Once on the other side of the panel, the toggle opens and is drawn against the back of the panel when the bolt is tightened. Unfortunately, these can only be used once, as withdrawing the bolt will cause the toggle to fall into the cavity. This feature also applies to nylon or plastic anchors, which are used with screws instead of bolts. For a more ‘permanent’ type of fixing, a nylon toggle is available that remains in place when the screw is removed. This is made up of a toggle bar, a slotted collar which remains on the outer surface of the panel, and a ridged nylon strip which joins the two. The toggle is first pushed through the wall panel and the collar is slid along the strip into the hole. The strip is then cut off flush with the collar and the screw is inserted. Alternatively, you can use one of the anchor devices with a flange which remains on the outside of the wall to prevent the body of the fixing being lost in the cavity if the bolt is removed. Solid walls are generally made of either brick, concrete, or lightweight cellular or aggregate building blocks. Attaching objects to brick and concrete is usually straight forward, and a secure fixing can be made with masonry nails or any of the standard types of plug and screw fixings in the case of cellular blocks, an adequate fixing can be made by simply drilling and driving in a screw. Care is needed, however, when fixing to aggregate blocks as these do not provide as secure a bedding as the other materials. These can be used to fix such things as shelving battens, picture rails, skirting boards and studs for wall panelling to most types of solid surface in the home. They are tempered to prevent bending and can be nailed straight into the wall with a hammer. Special cartridge tools which fire the nail into the wall can be obtained. These are particularly useful where large quantities of nails need to be driven. Two types of nail are available. One has a straight shank and the other a twisted one, which improves penetration into hard materials and helps keep the nail firmly in place. When nailing, always drive the nail in at right angles to the wall and ensure that the nails are long enough to penetrate at least 13mm and not more than l9mm in into the masonry. If the wall is plastered add the thickness of the plaster to the length of the nail required. To prevent them from snapping, nails with straight shanks should be gently driven into the wall with light hammer blows aimed to hit the head of the nail straight on. With twisted shanked nails, start the nail off with light hammer blows, and then use heavier blows to drive the nail home they are stronger than straight shanked nails and will not break so easily if possible, wear goggles as protection from flying chips of masonry or broken nails. Most household objects can be firmly attached to solid walls with one of the many types of plug and screw fixings available. They all require a pre-drilled hole, which can be made with either a hand boring tool or a tungsten carbide-tipped masonry drill. To make a hole with a hand tool, first tap the tool with a hammer through any plaster and then use firmer blows when the masonry is reached. Twist the tool slightly after each blow to ensure a neat hole and to stop it jamming. Once the required depth for the plug has been reached, remove the tool and blow out any dust. If you are using a masonry drill, you must use either a hand brace or an electric drill with a speed reducer. With some drills this is built in but an attachment is available to reduce the revolutions of a fixed speed drill. As you drill, press firmly so that the bit bites into the masonry. Remove it from the hole a few times and clear away any debris. Take care to keep the drill steady or the hole will become larger than required. If this does happen, you will have to pack it with a suitable filler. A percussion drill is desirable for use with concrete as it saves time and wear on the drill bit. This can be hired but, again, an attachment for converting an ordinary drill is available. 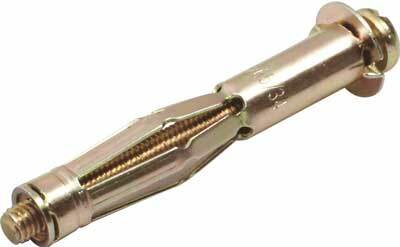 Second, the screw shank must never be allowed to enter the plug; this would weaken the fixing and the masonry. If the thickness of the article to be secured is less than the length of the screw shank, sink the plug further into the wall. When the hole has been made, first insert the screw a couple of turns into the plug and then push the plug into the wall. Then tighten the screw until the shank is about to enter the plug. Withdraw the screw, attach the fixture and then screw it up tight. 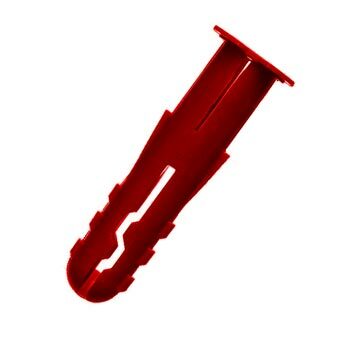 Plastic wall plugs are also available and come either as strips which you cut yourself, or in pre-cut lengths. They have the advantage of being rotproof and waterproof, and are colour coded for size. The main problem encountered when attaching objects to walls made of aggregate building blocks is obtaining a firm anchorage for the fixing. Although light objects can often be adequately fixed with standard plugs and screws, it is safer to use one of the many nylon plugs designed for the purpose. These have ‘teeth’, or ridges, which grip the surrounding material, and ‘fins’ which prevent the plug rotating while screwing. They will also take screw shanks with little distortion, and can be used in normal masonry. Another device that is useful for fixing to aggregate blocks is the’Rawlnut’. This has a rubber sleeve which, when the bolt is tightened, expands and compresses against the surrounding material. lt can also be used for fixing to other types of masonry and is suitable for hollow surfaces.